Have you ever received a message from someone stating he is a PlanetRomeo ‘Event manager’ or ‘Welfare Officer’ telling you: “You are the winner of £150,000.00 GBPS and other prizes”? Well, we, the guys of PlanetRomeo, wish you all the health and wealth of the world to live like a king (or queen), but we will never be able to give you such a prize as a promo or in a lottery (sorry for this 😉 ). Or maybe some good looking guy contacted you, sending an invite to view him on his webcam, free of charge? But, you have to fill in your credit card details to prove you are older than 18? There are many gorgeous Romeos, but if they ask you for this information it is a scammer, a common form of cyber crime. Hundreds of scam profiles are created each day and our system detects and blocks the majority automatically. Unfortunately, some of them slip through, because some scammers use unique profile content each time and therefore appear to be like any other new user. Credit card details are very valuable to scammers. They will try anything to get you to share this information for their own benefit. To be clearer, they want to rob your bank account. 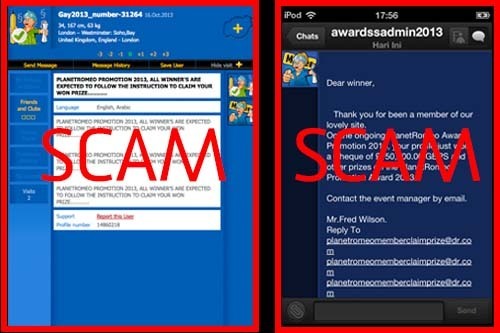 Scammers often pretend to be PlanetRomeo. They even use Mother, or our logo as their profile picture to gain your trust. But, always keep one thing in mind; a PlanetRomeo employee will never ask for your complete credit card details. If you are a victim of cyber crime yourself, always contact our Customer Service department. Unfortunately, the prosecution of cyber criminals is outside our control, but we do everything in our power to reduce these criminal activities on our platform. Because it’s a serious form of criminality, report it to your local police as well. Luckily, most of you know about the existence of cyber crime and recognize profile or message content scammers create. Please help us, and your fellow Romeos, by reporting these kinds of messages as ‘Spam’ at the top of the message or report the scammer’s profile as ‘Criminal’. We appreciate it.